Location : Old Goa, near Se Cathedral. Main Attraction : Exquisite architecture. How to Reach : Local Transport within Panaji. 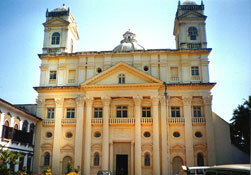 The St. Cajetan church is located in Old Goa near the Se cathedral church. The church is visited by numerous tourists because of exquisite architecture. This vast and strikingly beautiful church has been constructed on the primary design of the Basilica of St. Peter located in Rome. The architectural style is basically Corinthian in nature and is used generously inside as well outside the church. The Saint Cajetan church of India was originally named as Church of Our Lady of Divine Providence.The church has been constructed using laterite blocks and has been plastered with lime. The stunning altars are golden and are decorated with lovely carvings in the Baroque style. The architectural style of the temple is very famous all over the world and never fails to amuse tourists who visit this place. Inside the church, you will find three altars at the left that are dedicated to Holy family of Our Lady of Piety and St. Clare. On your right, you will find the altars of St. Cajetan, St. John and St. Agnes. The altar dedicated to St. Cajetan is the largest in the church. A wooden platform emerges from one of the docks and is beautifully adorned and decorated. There is a well in the premises of the church that is very old. The presence of this well has made many historians speculate that there was a Hindu temple at this site. The temple might have been destroyed during the time of invasion. Some others believe that the well was planned by the architect in order to provide stability to the structure.